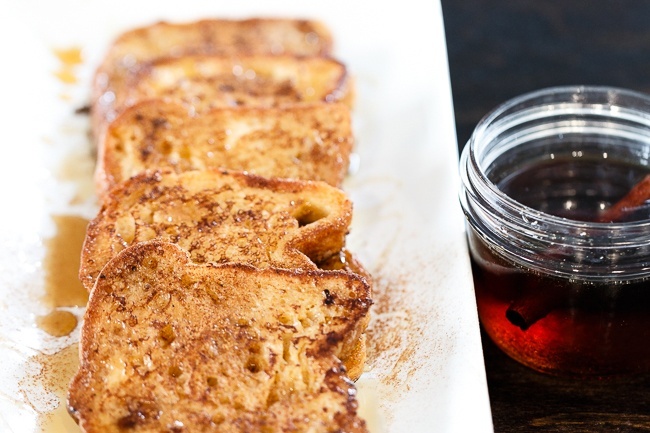 Prepare yourself for a new type of French Toast: one that is taken up a notch with a spiced maple syrup! The subtle difference of infusing your maple syrup with fragrant spices such as cinnamon, star anise, peppercorns and cloves is what transforms a classic dish into a gourmet dish. 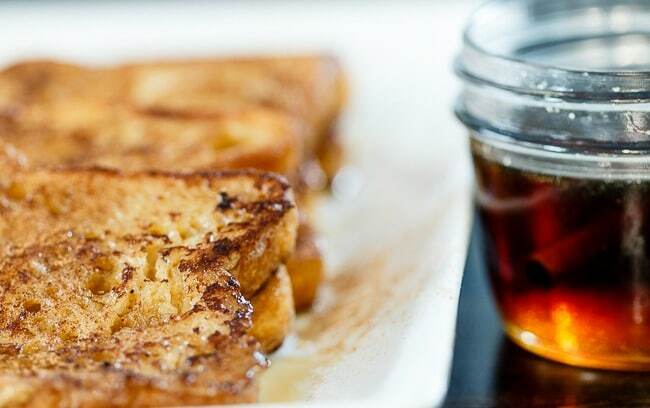 The addition of orange zest adds an extra depth of flavor and brightens up the maple syrup even more. It seems like a lot of work but it is something you can easily create at home within minutes. 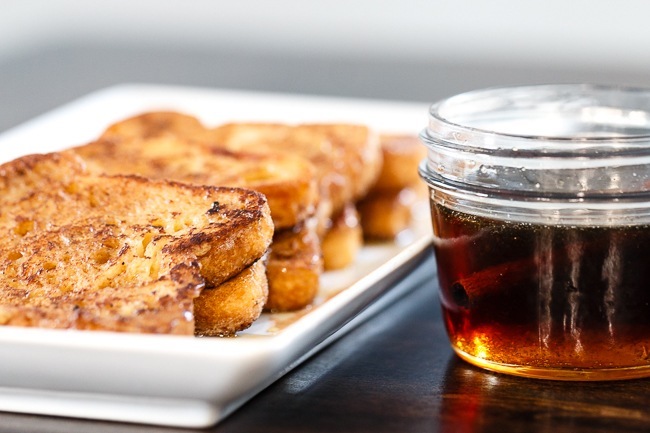 Make this cinnamon French toast with spiced maple syrup at your next brunch party and your guests will be raving about the five star meal you created for them! Place all the ingredients in a small sauce pot and simmer on medium-low heat for about 10 minutes. Turn off the heat and pour the mixture into a container. You can taste the maple syrup at this point and if it is to your liking you can strain the syrup and use it immediately or refrigerate for later use. If you would like a stronger spiced flavor keep the spices in the syrup and continue to infuse overnight in the refrigerator. It should keep for about 2 weeks. Whisk together all the ingredients, except bread and butter, in a mixing bowl. Pour the custard mixture into a shallow dish such as a pie or casserole dish. Place a slice of bread in the mixture and let the mixture soak into the bread for about 1 minute on each side. Remove the bread and drain off the excess mixture. Melt about 1 tablespoon of butter in a skillet over medium heat. Place the dipped bread onto your heated skillet and cook for about 1 minute on each side, until lightly golden brown. Melt more butter as needed and continue soaking and pan frying the remaining bread. 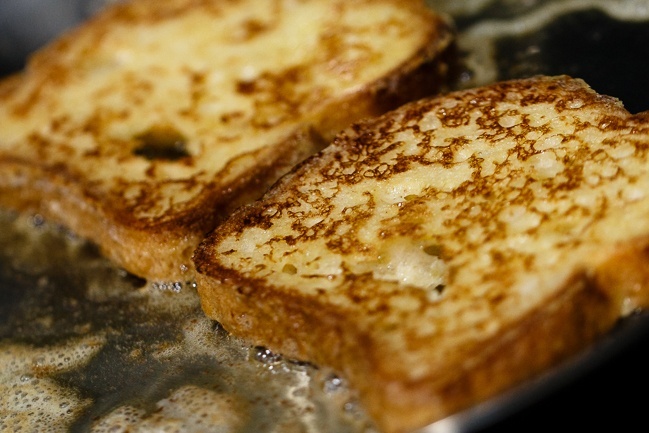 If you are making a large batch for a party, you can place the cooked french toast in the oven at 250 degrees Fahrenheit to keep warm as you continue to cook the remaining french toast. Serve with spiced maple syrup and enjoy! !